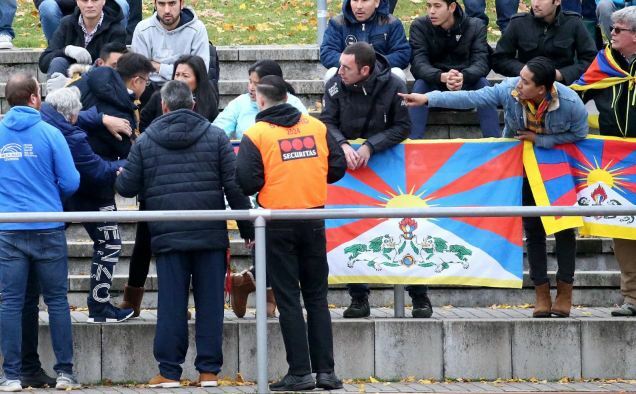 (TibetanReview.net, Nov20, 2017) – An under-20 team from China stormed off the field in the first of a series of friendlies against German fourth-division clubs in Mainz on Nov 18 to protest fans’ display of Tibetan flags. The game, being held at the TSV Schott Mainz, was delayed for about 25 minutes and resumed once the protestors, stated to number six, were convinced by stewards to remove their flags, reported the AP and other agencies Nov 18. The game, against Schott Mainz, was reported to be the first friendly for China’s under-20 team against sides from the southwest division in the fourth tier of Germany’s league system. It was being watched by a 400-strong crowd plus five camera teams and 25 reporters, reported the AFP Nov 20. With the match being televised live in China, the juniors only agreed to continue after the protesters from ‘Tibet-Initiative Germany’ – four Tibetan refugees and two Germans – took down the flags, the report said. “We want to draw attention to the unlawful and violent occupation of Tibet and the suppression of fundamental human rights,” one of the activists was quoted as having told the German Press Agency. The China U-20 team was controversially included in the fourth-tier Regionalliga Sudwest this season after just 19 teams qualified for the league, reported goal.com Nov 18. Needing to fill up the teams’ fixture list, the German soccer federation added the Chinese team for friendly matches, the reports said. However, three teams have refused to play the Chinese after their fans protested. The other 16 clubs in the 19-strong league will each be paid €15,000 (US$17,634) for playing the junior team, said the AFP report. The Under-20 side was stated to be in Germany to play 16 friendlies against lower league clubs in an experiment, which runs until May, aimed at advancing China’s chances at the 2020 Olympics in Tokyo. The experiment came about after Angela Merkel’s German government signed a five-year football partnership agreement with China’s vice-premier Liu Yandong last Nov, said the AFP report. Liu was previously China’s top official on Tibetan affairs.